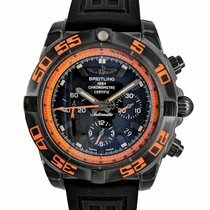 Mint condition and with still over 1 year remaining on Breitling warranty. Very hard to find with black and orange leather strap. Shipping fully insured via DHL express next day delivery.